Ending human trafficking training9 a.m.-2 p.m., YWCA, 608 W. High St., Lima. $40. Register by Nov. 3 at nwohioaglow@gmail.com or 419-234-4375. 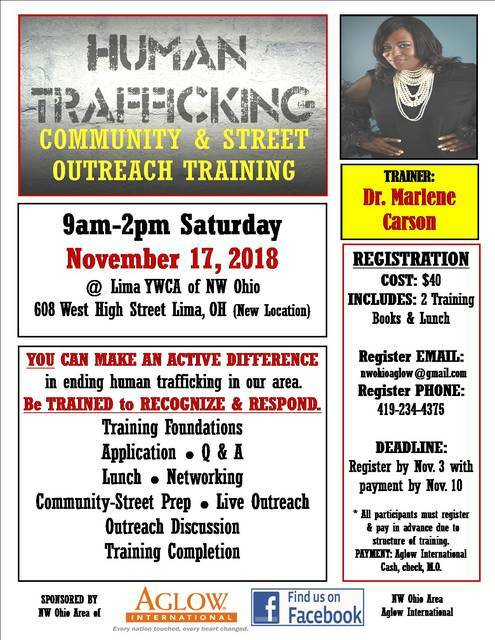 LIMA — A training on ending human trafficking will be from 9 a.m.-2 p.m. Saturday, Nov. 17, at the YWCA, 608 W. High St. The trainer is Dr. Marlene Carson. The event is sponsored by Northwest Ohio Area Aglow International. Cost is $40, which includes two training books and lunch. Registration is due by Nov. 3 at nwohioaglow@gmail.com or 419-234-4375.